I love it when I'm able to read a wonderful romance story and at the same time feel that I have gained knowledge in some way. 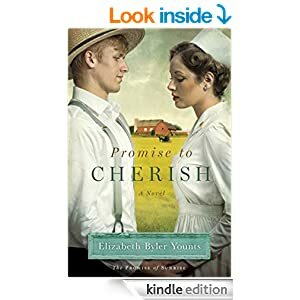 Elizabeth Byler Younts has taken the time to research the era of WWII and weave that into a story that will keep you on your toes till the end. I've known about conscientious objectors for sometime although I didn't know about the Civilian Public Service Unit. When drafted, the men who chose not to fight were then sent to labor camps and mental hospitals to help during the war. What a great service they also did for our country. Promise to Cherish follows Christine, a nurse, and Jack, who she thinks is her ideal suitor. The first date with Jack though proves that he is not the one. Eli, a member of the Civilian Public Service Unit, befriends her as she goes through the trail of her young life and gives her the support that she desperately needs. While reading through this book I went through many emotions such as outrage, sad, happy, hopeful, and finally joy. Such a wonderful read! This book was sent to me in exchange for my honest review from Howard Books, A Division of Simon & Schuster, Inc.